Step 1 – don’t make a sleeping mask at all. Get rid of the elastic bands. The “less than black out” format. And for the love of snores, get rid of scratchy, sweaty fabric. Oh, and make it all right here at home, in Canada. Nite Hood gets its Bamboo fabric knit locally in Toronto to allow for the best finish and quality control. This double-stretch bamboo fabric is very, silky and soft. It feels incredibly light and smooth next to the skin and drapes beautifully. Bamboo is an excellent choice for year-round clothing, because of its micro-porous structure and natural breathability it keeps you cool and comfortable in hot weather and warm and cozy in the cold. It is naturally grown without the intensive use of chemicals. This fabric is sound ecologically, has reputed microbial properties, and it is comfortable to wear. Taking things further, we’ve worked intimately with our suppliers to make bamboo fabric even better. The way we knit the fabric makes it fit you like a sleep mask never could – relaxing and contracting to form to you. It stays on (no more waking up with padded eye-covers hanging over your nose). PLUS it’s – Durable, Washable, Breathable and Cool. And we’re proud to say it’s only available with Nite Hood. Do you have a store to buy this from in Toronto as I live in Toronto? Hi Linda. Model Citizen” in Kensington Market has them. Hi, Are these sold in Vancouver? Hi Jan, not at the moment. You have any suggestions for stores? We like to place them in stores that curate Made-in-Canada designs. 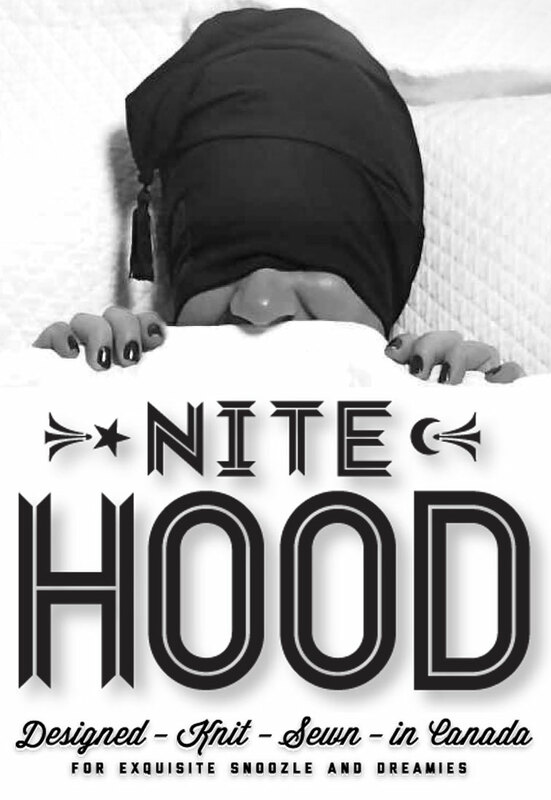 Is there any storeson Vancouver Island that sell Nite Hoods? Also, I see from the video the hoods are woven in white thread – obviously dyed either black or purple after. Sometimes items like this have an odour from the dying process that doesn’t ever go away. Is this the case with Nite Hoods? As a person with scent sensitivities, I could not have it on my face all night if it gave off tap dye odour. Hi Wendi, our Dyes are reactive and quit fast in the fabric. We don’t finish the fabric with any chemical softeners either. You won’t find any chemical odors from it. It breathes very well it should work well for you. First thought: HAT HEAD!!! I can barely wear a normal hat without it seriously messing up my curly hair. I can’t imagine what I would look like after sleeping though a 4 or more hour flight. Maybe that’s not an issue with the bamboo fabric??? If you get the Adjustable there is a bit more room for your hair. The Bamboo is very breathable so it won’t heat shape your hair. We offer money back guarantee – give it a try – let me know if it works for you.